We woke up late on Buddy’s last day, and neither of us wanted to get up. She was sleeping with her head shoved under the bed, our Headless Puppy. I knew it was the last time I would wake up with her there, and it was tough. I trimmed her paws, and then we got up for breakfast. The Husband said, “This is Buddy’s day. It’s a celebration of her. 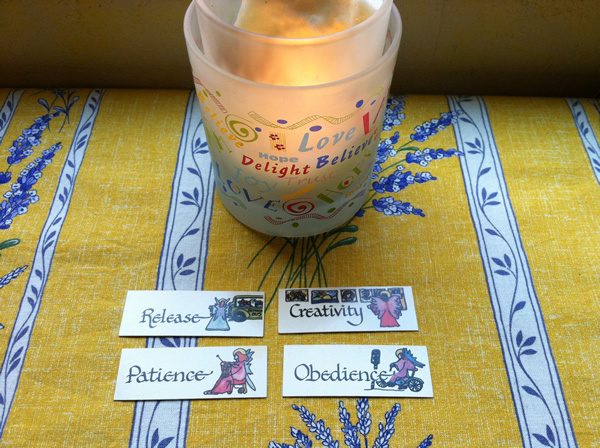 We have to focus on the joy.” We lit a candle, and I laid out the angel cards face down on the table. Angel Cards come in a little fabric bag covered in hearts. Each has a single word on it—like Love, Acceptance, or Balance—with a sweet watercolor illustration. Some people pick one every day, others once a week. We pick them on special occasions, especially when we are starting something new. We spent some time in meditation, setting our intention for the day. We wanted the day to be beautiful, to enjoy it, to stay present. Over the last two months, the cards’ meaning has continued to evolve and enrich my grieving process. I would never have thought to pick creativity, and yet writing about her and developing recipes for the book has been incredibly uplifting. I’ll write more about the other cards soon. Today’s post is a brief excerpt from my second book: Golden Angels: Lessons in Love and Loss from Buddy Girl and Daisy May . It’s part of our mission to help you build a healthy life through food and lifestyle choices. Look for posts on Mondays featuring gluten-free, sugar-free recipes made with healthy plant-based ingredients. Thanks so much Liz. Her site looks lovely and I look forward to getting to know her. Dog people are the best.